When it comes to in-home businesses and startups, many have co-mingled monies at the start. 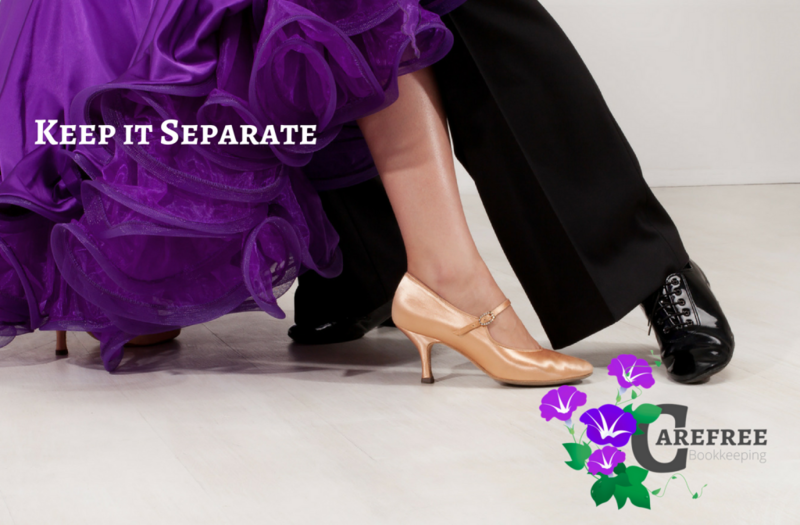 This article is going to explore why it’s important to keep it separate! Let me introduce you to Kathy. When I met Kathy, she was just starting her cleaning company. She asked me to sit down with her and review what she was doing and how she was doing her books. Bookkeeping is not her strength and why would it be? She is great at organizing and cleaning and that is what makes her happy. Kathy loves helping people taking care of something people don’t like to do and it’s easier to clean someone else’s house. Kathy had her business created using a limited liability corporation classification with the state (LLC), and a business checking account was set up using a federal EIN number… and she was using this account for business. But, writting checks both personal and business reasons from both her personal and business checking accounts. “Kathy, you’re doing great”, I said. “You have several clients that love you and you are making an income that will support you and your family. The one thing I would adjust is you paying your personal bills from your business account.” Kathy’s response was a common one based on convenience. Kathy explained she does it this way because when she’s out shopping and knows there isn’t enough money in the personal account at that time and there is money in the business account; and vice versa. And, since she is the business, and this is her money, she didn’t see it as a problem. This was reaffirmed through advise from another party who said this practice was perfectly okay as long as she coded it as a business expense in her accounting software. And, since her taxes were all filed under her personal taxes; business and personal expenses combined, she figured this should hold true. Yes, accounting software let’s you categorize personal money from business funds under an member or shareholder draw/distibution account, and as a self-owned business you’re filing everything on your personal returns, but by doing it this way you’re not protecting your corporate veil you created when you set up your LLC. The corporate veil is there to protect your personal life from your business. Let’s say you’re organizing and cleaning someone else’s house and a figurine breaks. It turns out that figurine was an original Hummel; past down from the homeowner’s her great-great grandmother. Forget the personal value of the item for a moment, the financial value of this figurine is $1,500.00 and the client wants you to replace this item. Because you have been paying household bills and extras using your business account or assets, this client can now sue your business and your personal assets. This cross-contamination of funds has removed the protection of your corporate veil and has opened up scrutiny of all of your assets; business and personal. Kathy started thinking about this and wondered if that’s what had happened at her previous place of employment before she moved on and started her own company. Kathy divulged that she had worked at a moving company who would come in and pack up a house for a customer. On one of these occasions, a crate of high-end art was damaged during the move. The owner of the moving company was sued and the claimant was able to go after the business and the owner’s personal assets to settle the claim. As a result the owner of the moving company not only lost the business but their home, too. We don’t have all of the details, but it was understood the owner only had one checking account they used for both the business and personal use. What’s the easiest way to protect the corporate veil and your personal assets? When paying personal bills with a business checking account it leaves the door open to pierce the corporate veil you had set up with your LLC. So, how can you pay your personal bills and still protect your family from business claims? The answer is a simple one… by doing draws to yourself on a weekly, bi-weekly or monthly basis; just like you would with payroll. Setup a schedule and a plan, and stick to it. Kathy eventually figured out how much money, on average, she had been paying personal bills with. Armed with that information, Kathy setup a payment schedule for herself from her business account. Kathy took a business draw twice a month to her personal account and used this to cover part of her household obligations. Businesses with income that is a little less predictable should still plan on “draws” from their business accounts to “pay themselves” to their personal accounts and avoid co-mingling assets to ensure the protections setup under their corporate status stays intact. Looking for more information on the subject, or need help re-organizing your accounts this year?